The Height Challenge was a way of showing how tall various people of different height can look against a genuine 5ft 8 guy like Big Rob, with visual examples of height differences, like a 3 inches or 5 inch difference etc. Thanks to all who took part and all the volunteers. All stadiometer measurements were 1/8th inch more than actual height, because the stadiometer has a 1/8th inch error...so when I measure 5ft 8.25 on stadiometer I am really 5ft 8 1/8th. Hey, Rob! I recently discovered your blog and YouTube channel and have become obsessed! I think it's really cool! I was looking for your expertise/opinion. I wake up at 6' 3/16", am down to 6' 0" within an hour of waking, and typically have shrunk to 5' 11 11/16" by late afternoon/evening. If I lift weights, do rigorous physical activity or am up for more than 24 hours (I'm in the Army), my height can decline to as low as just above 5' 11 5/16". In your experience, is this normal? Is there any way for me to delay or reverse the decline in height throughout the day? Also, with this level of fluctuation in my daily height, is it reasonable for me to claim 6' flat, as I currently do? Some folks assume I'm a bit taller than I am, others shorter; probably distorted by the fact that I have broad shoulders, a relatively tall head and don't always stand up straight. What do you think? I think you are just about in the area to be able to say 6ft. You can understand the closer to 6ft (i.e. 5ft 11.5) the far greater the percentage of men in that range would want to round up. Since you're 3/8ths or close to that straight out of bed, about/almost 6ft might be a fair assessment. Shrinkage on average is close to 2cm, so that seems what you vary by as well. is there pics of you and the girls in heels??? Not really got any to hand. Rob how tall is challenger 13 now.Is he about 6'4"?? A fraction over 6ft 4. Hey Rob I have a question about the blue stadiometer. I have the same model (the Leicester) and it appears to only have a 1mm error at most. In fact the lines are smudged slightly around the 160cm mark which appears to cause the error as you can see here Click Here Anything under 160cm actually seems to be bang on but above 160cm it adds an extra mm. Does this sound possible or because it's the same model as yours does that mean it definitely has a 2mm error? I haven't looked at the blue stadiometer for ages, but this moment, I dragged it from the deep recesses of the kitchen cupboard to have a closer look at those marks and I think the tiny errors are in the joins. On mine the 63 to 64 'inch' is 1mm too small. The 43 to 44 inch is about 0.5mm too small. The 23 to 24 inch is about 0.5mm too small. All the other inch divisions out-with those 3 joins look properly marked. When he was 6ft 3 3/8th I'd have been about top lip range. If your dad was on celebheights would he get 5'8 3/4 or 5'9" currently I know you mentioned he was 5'10 peak but what would he get for his currently because on a stadiometer like that I got the same exact height as what he got and it's consistent with measuring tapes as well though i can measure 5'9 1/4 on it as well and measuring tapes during the same time of the day. The last time he was measured was a couple of years ago at 5ft 8.5 when he was going to turn 80...at 82 it is hard to tell his exact height because generally his posture isn't great, I would still expect him in 5ft 8.25-8.5 zone today. Could you put the 2018 update of HC 10 ? Hey rob, where does the man on the far left come up to on challenger 13s dad? And is he 168 cm? The last time I measured him (a few years ago) on the blue stadiometer he was around 5ft 7. I don't know Challenger 13's parents. You would expect somewhere from 6ft 3 to 4 range, but it can of course depend on how big or small the person's head is. Rob, if you were to advice the plumber on what height to claim would you say "nearly 6ft2" ? he said he was measured 6ft 2 before that challenge, so he was surprised he came in so low, but I think 'almost 6ft 2' is ok for someone like that to claim. Rob, i read that Challenger 13 has actually grown to 6'4.25? How old was he when these photos were taken, and at what age did you see him reach 6'4? Whereas the other challenger #10 was around same age, he didn't really gain anything but #13 by age 19 did seem taller...nowadays he's near 24 although haven't seen him since that get together photo as he moved away. Rob, How old are challengers 5 and 13? Now they are age 50 and 23. The 5ft 8 might be looking very end of nose into moustache area, but it varies because not all eyelevels are the same. Rob what is chalengers 15 eyelevel? @Rob: Challenger 15 is very much on the heavy side Rob. What do you think his out of bed height would be? 6’6.25? @Rob, guys sorry I was incorrect with measurement, actually 5'6" might come more to my chin, to make sure once and for all Ive used a seca stadiometer, turned out 6'3.75/6'4" shall I go with 6'4"? I was sliding towards the latter initially, "a usually gigantic head" because I think it would very hard to get the measurement of your mouth level wrong, Its not like eye-level where you could tilt your head upwards/downwards by up to 2 cm hence should be relatively straightforward. Either you're measuring very incorrectly or you have an abnormally gigantic head if that's the case. Hmmm...my upper lip is about 5'4.6, I assume this would roughly yield a six footer? That's the kind of range you'd expect for a six footer. @Rob thank you Rob, I've actually measured 6'3.5 or a hair under 6'4" at times is that possible? I've measured facing the wall. If you had 9.5 inches from top of head to top lip, that would be 99.999999th percentile for head size. @Rob, just wondering if 5'6" comes roughly to my upper lip level how tall could I be? At least 6ft 1 range, and maybe even close to 6ft 1.5-2 zone. Rob, i measured my cousin at 172.5 cms with the tape measure, around 10 pm. Should he claim 5'8 (173 cm)? Joe with poorer posture in person can come across like a 6ft 4 guy, but when he stands tall he's much nearer 6ft 5, taller than HC 13, who is of similar range to Colin Salmon. Rob, apart from the 189 guy, do you think that all the challengers were around their normal low here or some of them might still dip a bit under those measurements? Mostly within 1/8th of their low, none of them were morning or lunch, we done them late afternoon through evening so I would be near my low. I think the camera does sometimes add a fraction or reduce it - in the plumber's case a fraction. It would look slightly different if you raised the camera to 173cm high. Challenger 12.1 - 5ft 5.75, wearing converse. Myself and Big Gemma, I'm in 0.6-0.7 sneakers so with Gemma extra footwear this turns her into a good example of how an exact 5ft 9er can look beside me. Anyways, sorry for making my question to long, lol. Hope you can answer it! Thanks! :). Rob are the height challengers some of the users from the site you have measured?, I would like it if you could measure me!, by the stadiometer or the tape. Hey Rob if you ever did another height challenge I would volunteer and take part!, but unfortunately I live in Rossington. Well if challenger 15 is a hair over 6'5" then, all those guys who told me they were 6'5" aren't because he's clearly taller than them! challenge 15 guy was atually not a full head taller than rob. he obviously tilt up his lower chin by 0.7-0.8" up. by relax down hes head looking straight he would look like pushing a head taller than rob. I am 179,6 cm after a good 4-5 hours, 180,5 cm morning height, 178,7 cm before bed. In converse shoes most people think I am a solid 183 cm because of my impeccable posture. Traditional or at least in America? Yeah. I think on most people who are inexperienced in height guessing, you can get away with 2". 3" will eliminate their belief but, 2" is easy to fool someone. People think I'm 6'4" and I'm only 6'2"! @rob If a legit 6ft 5 can be guessed 6ft 6-7 even 6ft 8..then a 6ft guy could also be guessed 1-2in more than his height depending on his physique. with good posture a true 6ft man could easily fool a good proportion of people into thinking they are 6ft 1. I guess challenger 15 really humbled alot of people. A 6'5 is simply enormous so all these speculated 6'4-6'5 or there abouts candidates need to be downgraded ie vince vaughn, jeff goldblum, hasselhoff, the rock, jeremy clarkson, lennox lewis, vitali klitschko etc Only klitschko would compare to this guy. Rob hardly reaches his chin :-S and a true 6'4 wouldn't be much shorter . As i stated earlier, robs head would reach his chin, with his head around 9 - 9.5 inches would equate to a 6'5 range fella. A 6'4 would be around the lower lip. In any angle, this guy could give off a strong 6'6 impression easily like any other 6'5 guy. With the 2mm error this guy would be right on 6'5 1/8 at his low. 6'5.5 could have def been his later morning height after being up for 3-4 hrs which would result in a 6'6 out of bed height I believe. So he's been honest because he surely measures 6'5.5 at some part of the day. You think that this mark is his low? Do you agree that if he would this height at his low, he's gotta be over 6'6 in the morning, a little but over? How tall he thought to be, Rob? 6'6? [Editor Rob: a few I already knew, some I didn't know what they thought about their height. rob any idea what challenger 15 weighs?? Lilo, aren't you like 6'5.5 yourself? Rob, he actually isnt neither 196 because you gotta take off 2 mm for the stadiometer! He's actually 195.95 so just a smidge over 6'5 (195.58)! This shows that a legit 6'5 can look enormous! And in reality this guy would be 6'5.1-6'5.2 range with the 2mm error. Rob, he actually isnt neither 196 because you gotta take off 2 mm for the stadiometer! He's actually 195.95 so just a smidge over 6'5 (195.58)! This shows that a legit 6'5 can look enormous! Am i right? No way that a guy like Armie Hammer is this tall! Rob, what was your guess before measuring him? Is Sam LAN Jiao's new name or do we have another 6'5" guy? At first I thought he was 6-5 to 6-5.5 but the more I looked the pics he Give an 6-6 impression . In the pics he can pass easily as a 6-6 guy. Rob, did he appear shorter than Daniel Cudmore? Cudmore must have looked almost 1.5 inches taller (if you consider he had shoe disadvantage) than this guy, if he really is 6'7! So Rob, we have a tie between me and Triplescrew. Are you just going to leave us as co winners or throw in a bonus challenge to break the tie? Co-winners seems pretty cool, cause we both had ups and downs but ended up with the same score haha. And I am also amazed at this guys height, without the camera angles #13 and #15 would look very close in height in person. wow I am amazed this man is only 6 foot 5. so hes around only 4 cm taller than the 6 foot 3 guy who was close to 192cm. He looks at least 4 inches taller how strange. I did think he was maybe a little shorter than my 200cm guess but only by about 2cm at most very surprising. Yeah my guess was based on the fact that your had came slightly below what was visible of his chin. I think challenge 15 was the one we, on average, were the farthest off from the true height. Right, Rob? I am happy with my overall ranking: I'm 9th in total points eventhough I forgot to guess on a couple of occasions. [Editor Rob: apart from the kid in 14, which was harder to guess. but before posting this I thought the average would have been 6ft 6, similarly with the plumber in challenge 8, it is not much surprise that the average in that case was near 6ft 2...it's just I believe in these 2 cases a good fraction got added. Wow, would never guess this huge guy is about my height...he's still gotta outweigh me by about 100-150 pounds! [Editor Rob: yeah I would say he did look about an inch taller...plus the 0.4 disadvantage cudmore had. Def suprised hes as short as 6'5.25. I thought he had at least 9.5 inches on Rob. Its probably because his head is slightly titled up giving him a taller impression. only 196? Wow I thought he would be no less than 198 cm... Really strange. this guy height may have proof many 6'5 actors are under the 6'4 mark slightly lower. a real 6'5 and look 6'6. My first impression of this guy was admittedly around 202cm!! I thought wow he's 6'7" or 6'8" at first glance!! We have a tie.. One more challenge tor the winner? [Editor Rob: I think a tie is a good way to finish. hey rob i put 200 cm but my first thought for this guy was 196 cm 6'5 so i was 1/4 inch off that prob the closest ive bin on these hieght challenges tho i put down 200 cm i was suppose to put 196 cm cuase thats what i first thought he looked proves 6'5 looks a lot taller and becuase the camera made him look 6'6 in one of the pics. That's the challenge finished. It was a tough one I think. 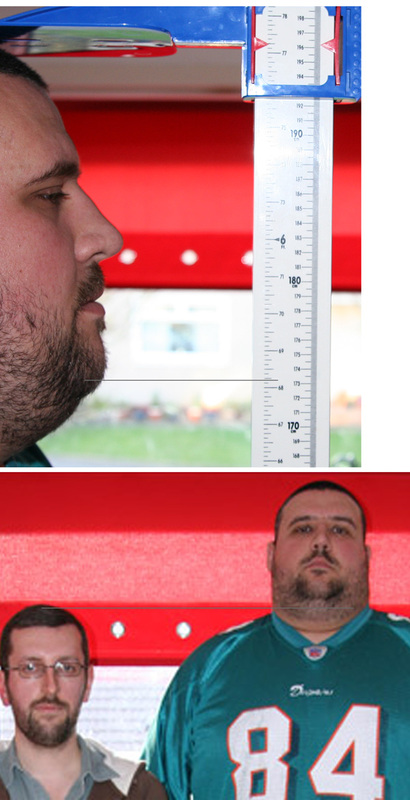 I'm not surprised the overall guess was 6ft 6.2 because in the photos the top of my head comes near an inch below his chin. 5ft 8 actually is around the tip of his chin bone. But we shot this 7-8ft away (like many of the actor photoshoots) and with the camera around my eyelevel in the horizontal shot meant there's always a chance the taller man (or celebrities) can potentially appear slightly taller. Shaun, yea 6'7-6'8 is too much for him. He has 9.5-10 inches on Rob which puts him in the 6'5.75-6'6.25 range. My guess is exactly *** cm. You need to buy some magical glasses. Cudmore has at least an inch on this guy with footwear disadvantage to Rob. I think the jawline/neck area and his posture is throwing you off and he creates an illusion of being 6'7"-6'8". If he's over 6'6.25" as Alex says I'd be very surprised. I have this strong feeling I'm going to be either as incorrect on this one as I was with #11 or worse. It's so obvious since almost everyone put a higher guess than me and I'm usually inaccurate. 197.3 cm. Granted I initially thought he was around 6'7". His huge frame makes him look taller than he actually is. But I think some here will be surprised he is shorter than they think. Note also he is actually standing a little further back than Rob so might be losing a cm or so. The more I look the big guy pics he is looking 6-6 easily to me. @Alex. I was being polite.. Rob next to this guy is like Popeye vs. Brutus . This big guy is hard , but I bet money he is in the 6'6 range . I don't see a foot , yet at least 9 "
He could neither reach the 6'6 mark, he's surely near that mark but i still gotta think about this big guy! @rob this guy should weigh about 250 lbs hes defintaly overweight even for his hieght. 250 lbs? Dude seriously you are way off. My uncle is about 250 at 6'3" range and this guy is far far bigger. This guy is nearer 350 than 250, seriously. I'd guess him at around 24 stone given his height range too. He's about the size of some of the NFL players I've seen who are about that weight. Height I will guess on 11 January but the more I look at it I have a feeling he is shorter than I had initially thought! @Rob...So u do take my words seriously..i asked u to get someone taller than challenger 13 and u did..i hope u get a 7 footer very soon..this guy is freakishly tall..huge....can take on 4-5 well built guys easily..i hope he never falls on anyone or else they will be crushed like a tin can..looking at his health i wonder what could be his diet..!! Hard WOW , 6'6 is my best guess ... I'm for Alex or TripleScrew , Maybe a underdog ? Okay, since I have been so bad at this, I will give it one last shot. I would say 6 foot 4 and a quarter. [Editor Rob: he said he used to, but does some MMA. Hahaha awesome Rob I was expecting another 6-1-6-2 guy but you sure saved the best till last. This guy looks hard as hell, I wouldn't want to face him on a rugby/American football team or anywhere else for that matter!!! I don't think he's quite as tall as I first though. Ok did terrible in last height challenge for this guy i am going to go 200.50cm. Hopefully this might redeem me lol. I know this is my first guess in the challenge and would still love to try it. My guess for #15 is 201.7cm. Triplescrew, it looks like its down to me, you and Tim. This is prob only a 5 point challenge so at most Tim would tie us I think. My estimate for this guys height is *****. Rob who is this guy though? He could be a very intimidating person I bet! Wow this guy isn't just tall but hes huge. Looks to be 375-400lb range with over a 20 inch neck! A solid 6'6.2 and I mean solid!!! This is the final height challenge. Jenny took these photos about 7ft away from us. The horizontal one she took it normal stance, the vertical one she lowered the camera maybe a foot lower than her eyelevel. My money is on Alex to win it all. Good luck! No matter who wins we can all call ourselves height nerds with an unhealthy addiction to this site, lol. Hey Rob, sorry to be a pain but shouldn't I be listed in third place for the result of 14.4? I didn't make the final cut. She was 149.55cm and I guessed she was 149.2cm (4'10.74") whereas linke (5th) guessed 4'10.6"/148.85cm) Matt (4th) guessed 4'11.13"/150.2cm, and Sam (3rd) guessed 4'10.67"/149cm which I was slightly above. Shredder in 2nd place guessed 4'10.75", I was 1/100 of an inch behind that. Rob, I got 5 points in 2 of the challenges so wouldn't that be 10 points total instead of 8? [Editor Rob: the overall is separate from the 5 individual. Pretty good guesses really although I thought your Dad's hair Rob would have flattened down more! He must have been 5 ft 10 peak? Surprised 14.4 though is almost 4'11", I thought if anything I might have overcooked it. [Editor Rob: she could just manage almost 4ft 11 for a measurement, but standing normally in a photo she's closer to 4ft 10. Think your like me Rob and getting your days mixed up cos of Christmas - today is Tuesday! Apologies - Its just me that's lost track of the days lol!! Well Rob something you said about your chin level I doubled the length of your head and she was still shorter than 4'0.75 and thought 3'9" range didn't seem too far off. But usually when I think my estimate is good I end up just missing out on the points!! Grrr. Let's hear the results then and disappoint! And I bet you I won't even be in with any points overall even if I'm close, that's the way things seem to go!! 14.1 : 157,2cm // 5'1,75"
14.2 : 174,9cm // 5'9"
14.3 : 166cm // 5'5,25"
14.4 : 148,5cm // 4'10,5"
14.5 : 117 cm // 3'10,25"
Why aren't I on the leaderboard Rob, I'm pretty certain I'm on 21 points as I was on 16 and then I had 5 points from the last challenge!! I am really curious to see how tall 14.5 the kid is. That was a very tough one to call since hes that short. Also 14.4 the lady looks a full head shorter than Rob or slightly more. 14.5 , cat 5'6 lol , Kid 3'8 . Rob,I guess that old man is your father...isn't he? For each of the challenges, the top 5 (5pts,4pts,3pts,2pts,1pt). Best wishes to you, Rob, and everyone here! Wow this challenge looks to be tough especially the 2 on to the bottom being so short. I'll have to come back to this one and rethink! Wow now the family resemblances are starting to show. Challeneger #14.1 surely has to be related to Challenger #6. Is that your dad and mum Rob, I see some resemblance around the yes? He's a good looking older chap. 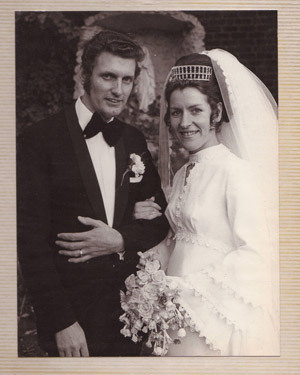 [Editor Rob: my Mother refused to take part in any height challenge, although This is my Parents in their younger years. Ah nice, thank you Rob, this goes to shoe that a legit 6'0 is not average height and still quite tall. It's funny when some people claim they feel average when they are 6'0 and above in the general height section lol. Hi rob..can u post challenger 10's eye-level measurement..was it 172.3cms..on average its 11.5-12cms for men..?? [Editor Rob: 4.5 inch is typical, the taller the average will increase a little, so it might be 4.5 around 5ft 9, but 6ft 3 could be 4.7 on average etc. My last question was meant for the dude from challenge # 13. Rob, how high is this guy's eye-level? He probably will become a legit 6'4! Anyway, this is a great height and im sure that he passes for 6'4 or even more to most of the people, if he has good posture! Rob , Ill only post on here to the next challger comes , I'm taking a break for a week , I'm glad I am getting better at these :) ! The kid is only 17 . There is a fair chance that he could grow a extra inch. Rob, your head looks to come right at the middle of his mouth. Isn't the mouth usually 7 inches from top of the head on a normal size head? [Editor Rob: between 7 and 7.5 is very common. [Editor Rob: the next challenge won't be one person, but will be a few different people like challenge 12. What happened to Physics Enemy? He was in with a chance with this too! how much did he claimed, Rob? 6'4? Really I was less than one quarter of an inch off and I'm not even top 5? LOL I'm getting slightly better with each guess. Question for Rob: what criteria do you use for the aggregate leaderboard scores? Is it the straight sum of points for each guess or are you contemplating some sort of average? For example, how do you rank people who are excellent guessers but came in late into the game vs not-so-good guessers who outscore them because they've tried all 13 times? Would you contemplate adding a new column ranking the "weighted average" scores? Thanks. hey rob, is his parents pretty tall as well. Im talking about challenge 12? [Editor Rob: challenge 13, the tall guy? This was a pretty tight challenge and I underestimated this guy by 7mm. I should have known he was that close to 6'3.5 though! [Editor Rob: the left photo is almost perfect as 5ft 8.25 comes up around his mouth in reality. There you go I said he was pretty bang on only an inch taller than #5. He could have been anything 6'3" and something but he just doesn't look over 6'4". As soon as I saw him I thought solid 6'3". He's only 17, unless he's one of the ones who grew very young and finished growing there is indeed a chance by this time next year he could be 194-195cm.